Matthew De La Tour is a talented artist with autism who has been producing art since he was a child. 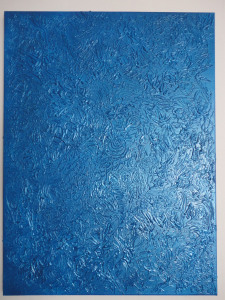 His work involves applying molten hot melt glue to a surface which he calls an ‘autistic expression’. 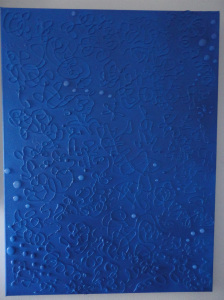 I first encountered molten glue in the 1980’s as a child creating bubbles on a name tag and lightly painting over them. At the time my teacher was unimpressed. That became a distant memory. In late 2007 I started using molten hot melt glue on some of my sculptures. 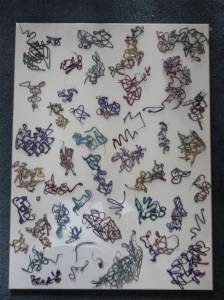 January 2011 is when I began devising new techniques. I eventually used acrylic paint and nail polish to experiment with. These were my rough drafts. This led to drawing with the glue gun on canvas, bottles, picture frames, high heeled shoes and books. The detail I was able to achieve was worth sharing with others to inspire others to believe in themselves and realize that nothing’s impossible. I love detail! Detail has always been extremely important in my art and life. Molten glue is like clay and can become anything from a thick wood pattern to a meticulous, thin, delicate spider web. 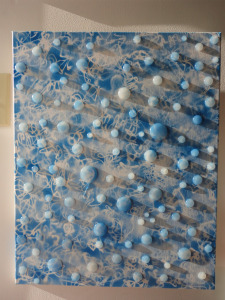 Drawing with the glue gun on a canvas is similar to using a pencil or detailing a cake. You must learn how much pressure to apply and know how much glue you need for a specific result. Start drawing simple shapes- like circles- triangles- and squares to get a feel of how the molten glue moves when you pull the glue gun trigger- remember molten glue will be very hot. Allow the glue to cool to your surface- then using a paint of your choice- lightly cover the glue on the surface- most paint dry’s in minutes. The paint brings out the amazing detail of the dry glue on your surface. There are many techniques and forms of application to discover when working with molten glue. For example: After painting over the glue on a canvas wait until the paint is dry, pull the glue pieces gently off the canvas and allow your creation to come forth. You will see the brilliant white of the canvas show through. You can repeat the process or add more paint and glue. You can gradually start making fun designs or even use the glue pieces as a complex stencil for creating even more fantastic art and inspire others! Start slow and take your time. Be patient and have fun. Work with a friend or make it a family event. A spark of determination can ignite and grow into a flame of passion. With hot melt glue you can do anything. With a little bit of inspiration – what can you create?